Two points separate Fylde and Chester going into this third v second encounter, with both clubs raring to go after a two-week break. 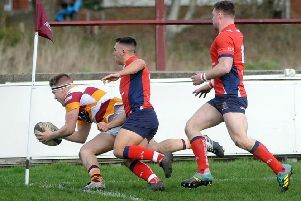 The winners could find themselves top of the pile if Hull Ionians slip up at Otley, whereas the losers will suffer a major blow to their top-two hopes with just four more games to play after this weekend. This is a battle between the league’s most freescoring attack – Fylde, who have scored 113 in their last two games – and meanest defence – Chester, though Fylde have conceded only 19 more points – but Spragg warns that the visitors’ offensive threat must not be underestimated. He told The Gazette: “The lads are excited and know what we are up against. They know what Chester will bring, what the challenge is and the potential impact of not getting the points. “Chester’s attack is better than it looks. Their number eight, Shay Owen, gets them on the front foot and scores a lot of tries (12). “Their strength is up front, where they have a big, powerful front row and second rows who work really hard. Fylde’s 15-6 win at Chester in November was the clubs’ only previous league meeting and the hosts’ only home defeat in 18 months, though that match came with nothing like the pressure of tomorrow’s. With Hull just one point above Chester and Huddersfield still in contention after winning last weekend’s game in hand by a point against Tynedale – they are four points behind Fylde – the point has been reached where any defeat could be fatal. Spragg said: “After losing at Hull, we spent a full evening setting targets. We set a points target and are on course with that, but we know that if we slip up we won’t win this league. 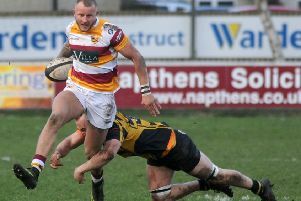 Fylde hope to have Elliot Horner, Adam Joyner and Ralph Dowds available after injury but are likely to be without their dual-registered Sale players, as the Sale Jets play a premier shield game on Monday. Spragg shuffled his back division last time out at South Leicester but is set to revert to his tried and trusted tomorrow, which means Tom Carleton moves from wing to full-back for his 56th consecutive first-team game; the top tryscorer is aiming to complete his second successive ever-present season. Ben Vernon will make a 150th appearance in the pack if selected.